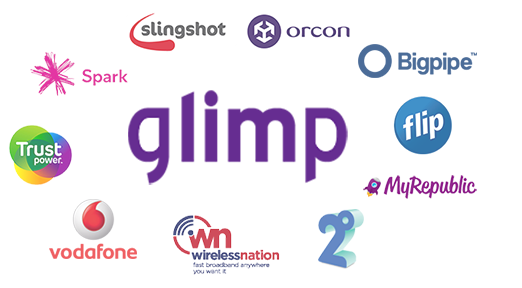 Compare NZ Broadband Providers with glimp. Switch NOW. Here at glimp we compare the best broadband providers in New Zealand. We show their latest broadband plans that are on offer. The broadband plans are ordered by Price, Speed, Data, Contract Length & Installation Cost. Only the most crucial and accurate broadband information is shown to make your decision as easy as possible. Below you will find more information about the broadband providers that we compare. MyRepublic is the New Zealand's first fibre broadband only Internet Service Provider (ISP). Their plans are truly unlimited and they're ready to unleash the potential of their fibre broadband network from Whangarei up north to Invercargill down in south. MyRepublic believes in delivering an awesome internet experience for all kiwis at mass market prices. All this with no lag, no limits and no holding back. Beyond ultra-fast internet access, MyRepublic's Pure, Gamer and Business fibre broadband plans provide a customised, enhanced level of service that goes far beyond what is possible on older technologies such as ADSL, VDSL or Cable. Since launching in 1996, Slingshot has been on a mission to challenge the telco industry and fight to give Kiwi families better value internet, backed by awesome service. Slingshot knows how important it is to be connected online, but also knows that getting there can be a little confusing and often more trouble than it needs to be. They've worked hard to make Slingshot simple, affordable and stress-free - because they know you've got more important things spend your time on than fiddling round with your internet. Slingshot are committed to making broadband easy, simple to use, and suitable for the whole household - whether they're madly streaming programmes, gaming up a storm, or just hammering TradeMe. Slingshot have a range of different Slingshot broadband plans available - Fibre, ADSL & VDSL. Some Slingshot broadband plans include a home phone line whilst other broadband plans are like Slingshot Naked Broadband and don't have a home telephone line. Compass Communications is a 100% kiwi owned independent internet and telecommunications service provider. Compass began providing fax broadcast services to business customers back in 1995 and now, Compass is the longest-standing competitor to Spark in the New Zealand telecoms and broadband market. Compass Broadband provide a variety of different broadband options including Compass naked broadband and Compass unlimited broadband. Compass also provide home telephone line rental and Compass telephone calling as well as Compass mobile services to households. Although not the biggest Internet Service Provider in New Zealand, Compass Broadband is big enough to make a difference whilst still being perfectly placed to understand the challenges facing New Zealand homes and businesses when it comes to connecting and using Broadband. Although initially a power company, Trustpower now offer Trustpower Broadband and are becoming one of the major broadband providers in New Zealand. Trustpower offer some fantastic Trustpower broadband offers and Trustpower broadband discounts for new Trustpower customers. Trustpower mostly bundle their Trustpower Broadband offering with their Trustpower power and gas. They have a couple of Trustpower Broadband only plans but to get the best value it is worth investigating Trustpower bundle pricing. Trustpower broadband plans are simple to select, compare and choose from. Trustpower give you the best broadband connection that is available at your home, so that could be Trustpower fibre, Trustpower VDSL or Trustpower ADSL. Bigpipe means fast, unlimited broadband internet in a variety of flavors starting with cheaper, accessible ADSL, to faster VDSL, and all the way through ultra-fast fibre broadband. No data caps, no throttling, no contracts, and great online service. So if you're after naked broadband internet with no data caps and no contract - get Bigpipe. It's internet the way it should be. At Bigpipe, they won't try to sell you a landline that you don't want or need. Some other internet providers only sell bundled packages, but they're just a broadband provider and they do their broadband naked and unlimited, the way it should be. NOW takes service seriously. That’s why NOW has local sales and service hubs close to their customers – NOW can be on your doorstep in a flash to sort things out. It’s also why they are established NOW techsperts because they know that sometimes you want more than just a helpdesk. Whether it’s the Wi-Fi dropping out or your iPad won’t connect, with NOW techspert service, it’s sorted! It doesn't matter if you are seeking services for home or at work, in Hawke's Bay, Tauranga, Wellington or Rotorua, NOW is your best choice! Whether you live in the beautiful remote Chatham Islands or in apartment in Auckland’s CBD, we’ve got you covered. Our urban, rural and business broadband solutions are fast, reliable and backed up exceptional customer service. Wireless Nation also provides bespoke solutions to overcome hurdles that may prevent connectivity; such as remoteness, needing internet access to a large area, or line of sight issues. These solutions, devised by our experienced team, are effective and affordable. Farmside is New Zealand’s leading rural broadband provider connecting Kiwi’s all over the country with fast and reliable internet and voice solutions. Live your life from where you really want to be with Farmside. We are proud to be a Kiwi company that can connect you and your family no matter what with a range of solutions to suit your lifestyle. We have your back through the RBI Wireless network, fixed line broadband (ADSL and VDSL), satellite or Fibre dependant on your location. Operating out of Timaru, the Farmside team understands rural New Zealand and the challenges living out of town can bring. Dedicated to timely and quality customer service, you can be confident your calls will be answered immediately by a Kiwi who understand you and wants to help. As part of the patchwork of rural NZ, we have strong partnerships with Farmlands, PGG Wrightson, Farmsource and Ruralco giving you option to either charge your Farmside service to your supply account or pay us directly.